6,000-year-old volcano on old Route 66. Amboy is barely a settlement, let alone a destination. With a population of 6, it's just a whistle stop on the way to Laughlin and Las Vegas. Actually, Amboy deserves a closer look, not just for Roy's Motel and Café, a time capsule of early 1950s kitsch, when Route 66 was king and cars didn't have air-conditioning, but also for a unique desert experience -- a hike into a 10,000-year-old volcano. 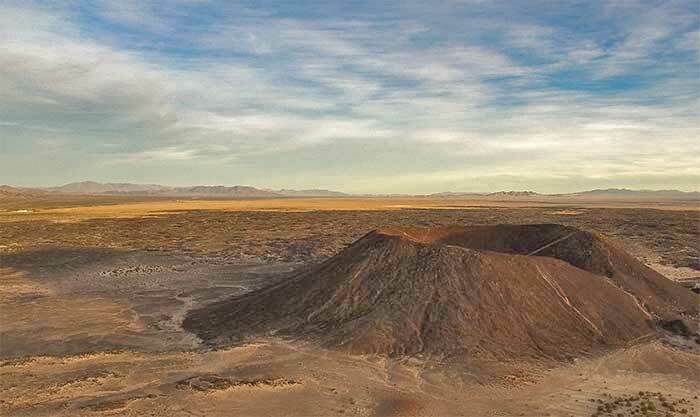 Southeast of town lies Amboy Crater, a 246-foot basalt cinder cone. The result of several explosive eruptions, it's accessible by two main trails -- one easy and one difficult -- and offers a perspective not only of itself, but also of the Mojave National Preserve and beyond. To get there from the Coachella Valley, take Highway 62 to Twentynine Palms, turn left on Adobe Road, then right on Amboy Road. As you near Amboy, about 45 miles from Twentynine Palms, you'll cross Bristol Lake, a dry lake mined for the calcium chloride used to de-ice roadways in colder climes. Across this prehistoric sea, you'll get your first glimpse of the crater cone. It rises above a labyrinthine lava field, a striking anomaly of black rock in the earth-toned desert. From the road, you can see where the flow of its lava stopped at the lake's edge. You should be able to park your car less than a mile from the crater base. Take note of where you parked it by finding a familiar point on the horizon. The desert here may appear flat, but it's not -- the jagged lava will block the view of your vehicle once you've left it, and, while you're likely to spot it from the top of the crater, it will be almost impossible to see once you have returned to the desert floor. The recommended trail, according to the Bureau of Land Management, heads around the cone's western half, leading into the "breach." While it is not visible from the road, the breach, where lava burst through the newly formed fragile cone, allows easy access, via a gentle sloping path, into the cone's center. A scar clearly visible from the parking area on the cone's northern face is not a trail. This treacherous path, which begins as a fairly defined trail, disappears on the steep face and leaves climbers scrambling on slippery slag. Once inside, you can cross the center and climb to the top. Here, you will get a good picture of how this crater, which is 1,508 feet in diameter, was born. First, lava exploded into the air, with the larger pieces falling immediately around the vent, breaking through where the breach is visible. Also noticeable inside the cone are small circles where later volcanic events occurred. To learn more, follow the pathway around the rim, noting the geology. Some of the rocks are porous, as you expect igneous rocks to be, but others are smooth, a phenomenon caused by the differing amount of steam held in the flowing lava. Also evident are lava "bombs," lava that was thrown out of the volcano and cooled during flight to form egg-shaped rocks. The view from the rim of the chocolate-colored mountains hemming the salty white lake is unequaled. The lake bed stretches to the horizon; the Mojave National Preserve, with its soaring mountains, is to the north. Trains cut through the desert on their way to Needles or Barstow. Cars on Route 66 and Amboy Road almost disappear in the desert's enormity. In this panorama, you're likely to feel that you are the only human for hundreds of miles, but you aren't. Remember that Amboy is just down the road. Yet you are likely to be as close to solitude as you will ever get. 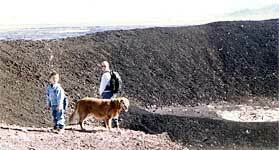 The Amboy Crater is best experienced from late September to late April. During the rest of the year, it's intolerable because of the heat. Expect to spend at least two hours on your hike, and be sure to wear durable footwear and carry plenty of water. When you're done, consider heading into Amboy proper for photos of Roy's Café and Motel, once a thriving little business on Route 66, now a shell of its former self, yet still offering a terrific time capsule of 1950s Americana. Roy's is open for gas, and there's a a little store where you can buy water and a postcard, and use the restroom. Many Hollywood filmmakers and photographers use this remote site for sets and backdrops. Amboy was purchased by Albert Okura for the amount of $425,000. Okura’s plans are to restore parts of the town, including Roy’s Café and the gas station. A 20-room motel and six bungalows are also to be rehabilitated in the future. The aim of the restoration is historical as well as commercial – a cracked window in the Café featured in many films was replaced. The store is open, and though they are not serving food yet, they are selling souvenirs. There is an old cemetery, a church and a post office nearby – all closed now – but the grave markers remind us of the history and the residents who used to live there. Click here to watch a video on this area. Read more about Amboy Crater, just off of Historic Route 66. During summer months or windy conditions, hiking to the rim is not recommended. There is an old scar on the face of the crater where many people hiked or tried to drive ATV's up the crater. This is not a trail and is DANGEROUS - please do not use. Remember to bring a hat, sunscreen, sturdy shoes and plenty of water. Watch out for snakes and other desert wildlife along the trail. Please practice Leave No Trace principals during your visit. Take Highway 62 to Twentynine Palms. Turn left on Adobe Road. Go three miles, turn right on Amboy Road. Take Amboy Road to Route 66 and turn left. Turn left onto dirt road and follow to parking area. 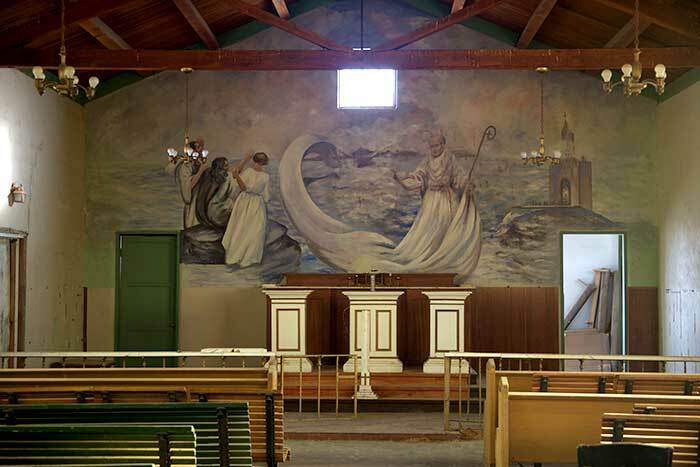 A two-hour drive from the valley, Amboy makes a nice day trip. Make sure you have plenty of gas and water when you leave Twentynine Palms -- Amboy is 60 miles into the Mojave from there. Hike in the morning and consider eating a picnic lunch at the crater. In the afternoon, head back to Twentynine Palms to tour Josua Tree National Park Headquarters as well as that city's eclectic art galleries and shops.